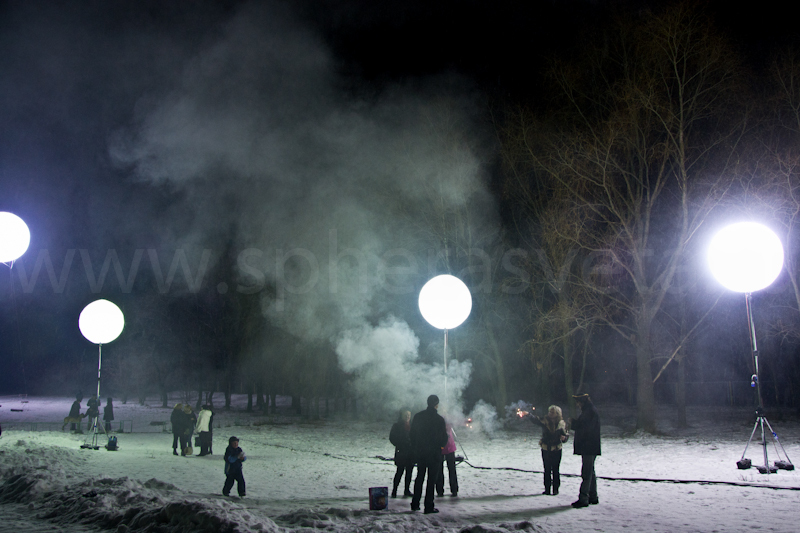 The Tripod sphere is a universal mobile device, which can be used for both indoor and outdoor lighting. The diameter of the sphere which is made of reinforced polyurethane film is from 1 to 1.5 m. Also the sphere is equipped with robust and durable extendable metal tripod, external power supply and electric cable 5m long. An advantage of the tripod sphere is an assembly and connection of device takes no more than 5 minutes. This device can operate 220 watts grid as well as by generator. It is also worth to notice that the total power of the lamps which the tripod sphere can can be equipped with equals from 250 W to 4 kW that allows to use this lighting fixture in pretty wide range. Today the tripod sphere perfectly works for night clubs and trade pavilions decoration, stadiums illumination, as well as in movie and video production. Moreover, they successfully used for construction works and rescue operations at night,as they are unpretentious in operation and provide an angle of distribution of light equals 360 degrees. Also, the tripod sphere can successfully serve as an alternative to existing advertising constructions. Our company is engaged in the development of innovative lighting unit Prizzmo360.